We would like to hear your suggestions for improving this website. If you have any comments on other information that we could include, if you have comments on the design, the videos, the layout, we would like to hear from you. 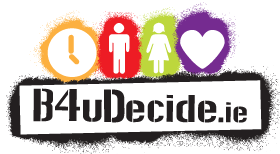 Alternatively, please email improvements@b4udecide.ie with your suggestions.